Everyone King wanted is "stolen" by now. Season 4 aka 2019 is here! Everyone is undefeated (as long as I hit send on this before too long, games will be starting any minute now) and everyone has high hopes minus the handful of realistic guys in DWHO. That said, ovfd and I put our heads together virtually to come up with some predictions for how the season will go. See below for the way it shook out for both of us. Interesting note: in the never-ending debate for which conference is better, I worked out records for each team and without any intent to do so, the wins total for each conference was identical at 128 so I guess the debate will rage on. UNLESS! 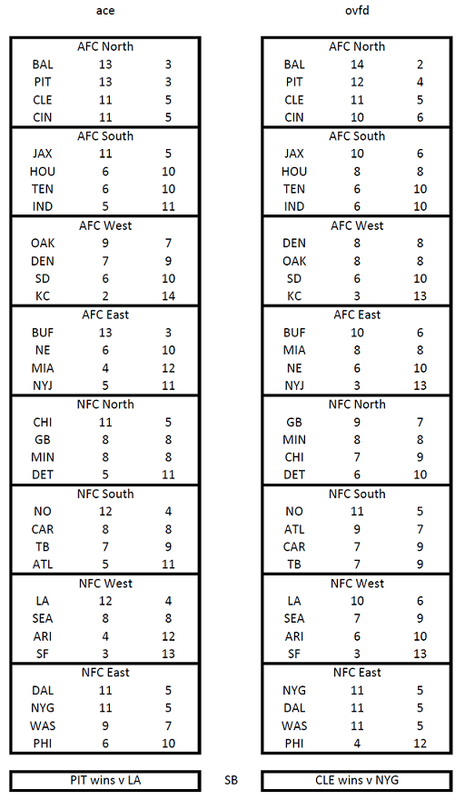 you want to go with ovfd's which has the AFC at 2 wins better than the NFC. Very excited about Ace's Space approaching 500 views!